Glass door handle comes in different color and sizes start from 250mm-600mm. Our organization is offering a distinguished segment of Glass Door Handle. These products are made from high quality components and allied material. Knobs and handles of all shapes, sizes and designs available. Hook Hangers and Decorative Ceramic products also available. 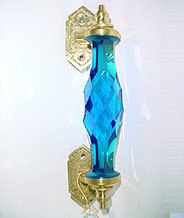 Glass bridge handles with brass fitting with various styles & colors. We Manufacture and export glass bridge handle made handicraft etc. With sincerity and hard work of our professionals, we have carved a niche for ourselves in this domain by providing a premium quality gamut of Designer Glass Door Handle. Good Quality Door handle with beautiful and elegent looks and a very competitive price. The handle adds value by improving the look of the window or door. The Good Quality ensures that the handles will not break later on like is the case with alot of other handles. We offer high quality of Glass Regulator Handles.